IFRS 9 (and the closely related CECL) is a brand new financial reporting standard developed and approved by the International Accounting Standards Board (IASB). Strictly speaking IFRS 9 concerns only the accounting and reporting of financial instruments (e.g. bank loans and similar credit products). Yet the introduction of the IFRS 9 standard has significant repercussions beyond financial reporting, and touches e.g., bank risk management as well. This is prompted by the fact that the framework requires embedding forward looking risk assessments in the measurement of the value of credit assets currently on the balance sheet. At the core of the IFRS 9 Measurement section is the expected credit loss calculation using scenario averaging of forward losses. Such expected credit loss must be calculated over the full lifetime of financial instruments (although, under IFRS 9 but not CECL, only so-called Stage 2 assets must be provisioned using the full maturity). Given the scope of applicability of IFRS 9 there is a vast array of possible implementations of ECL models / estimates. Nevertheless, at least for the larger banking institutions, the recent experience with large scale regulatory stress testing programmes appears to have had an influence in adopting a limited set of macroeconomic scenarios as a key building block. In turn those macroeconomic factors are affecting the estimates for forward exposures, default rates and losses-given-default (the so-called credit risk parameters). As an illustration, we may have derived within the IFRS 9 modeling framework a lifetime PD curve (also credit curve, or term structure of credit risk) as a function of tenor and macroeconomic scenario. 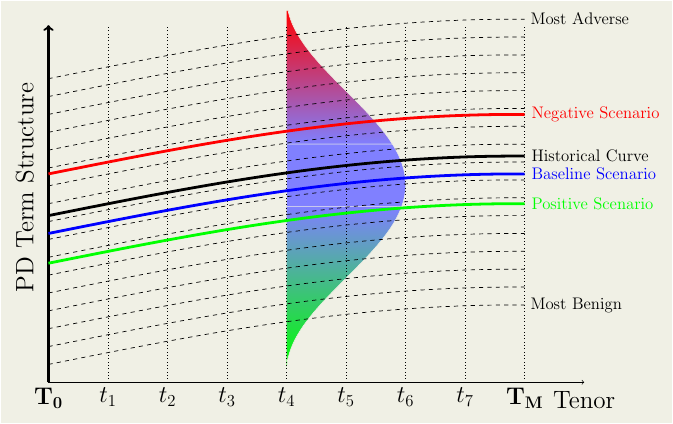 The picture illustrates how the probability of default term structure (used as an input for the ECL and ultimately loss allowance calculation) might shift for different realizations of the macroeconomic scenario. The different realizations of the lifetime PD curve, together with the probabilities attached to the different scenarios (and of course additional information such as LGD etc.) can be used to form an average expected credit loss as required. To make the relationship a bit more concrete, lets work through the following example. The average expected loss over the lifetime of the pool is then 23.4% The full distribution is implicit and is not be spelled out. But once a set of probabilities / loss pairs are derived, this allows also the calculation of loss variance. 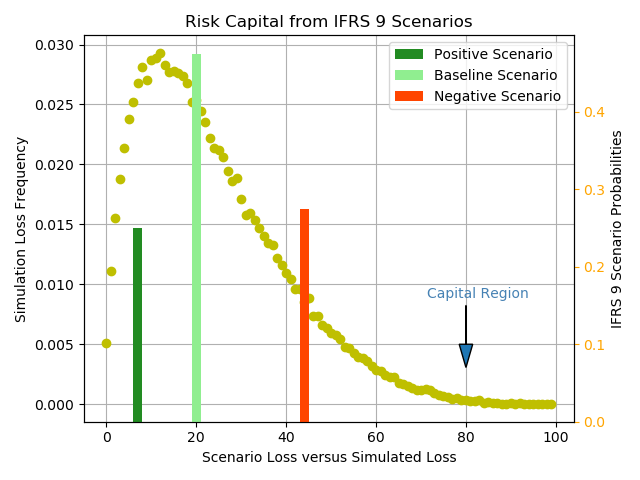 This is illustrated in the next figure where a simulation model with the same expected loss and variance as the IFRS 9 scenario calculation is used to obtain a more fine grained (interpolated and extrapolated) view of the loss distribution. In particular the region to the right of the most adverse scenario would be the region where losses reach a stress level comparable with the available risk capital. As it is fairly intuitive from the figure, estimates in that region must use additional information (for example model assumptions about dependencies). Scenarios geared towards expected loss measurement on a marginal basis may not be capturing adequately dependencies between different risks. Those important issues will be the subjects of future posts!